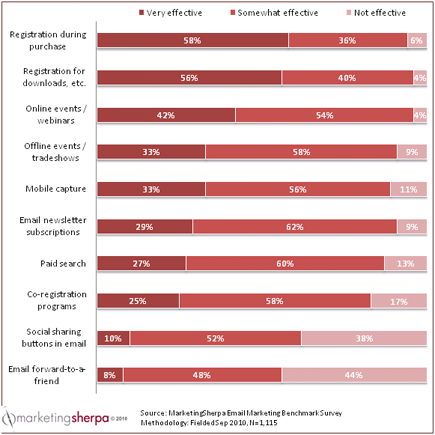 SUMMARY: Email marketing strategies have matured and are no longer strictly about increasing the number of subscribers. Today, the priority lies in building a quality list of names. We asked more than 1,100 marketers to indicate the level of effectiveness of each list growth tactic used by their organization. See the results in this week’s chart. These results align well with content marketing strategies. Tactics that deliver value to the customer such as purchased products, downloaded material and webinars develop trusted relationships which enable customers to share email addresses and contact information. For this reason, company blogs and published articles have become an excellent method of capturing email addresses. Expect to see growth in mobile capture in the coming year as marketers rank the effectiveness positively and the difficulty low. For additional research data and insights about email marketing, download and read the free Executive Summary from the MarketingSherpa 2011 Email Marketing Benchmark Report.